The protected bike lane will narrow crossing distances for pedestrians substantially on a wide one-way street cutting through residential areas. The newly-striped protected bike lane at Waverly Place on Seventh Avenue South. Photo copyright Shmuli Evers, used with permission. The Seventh Avenue protected bike lane now extends to the West Village. 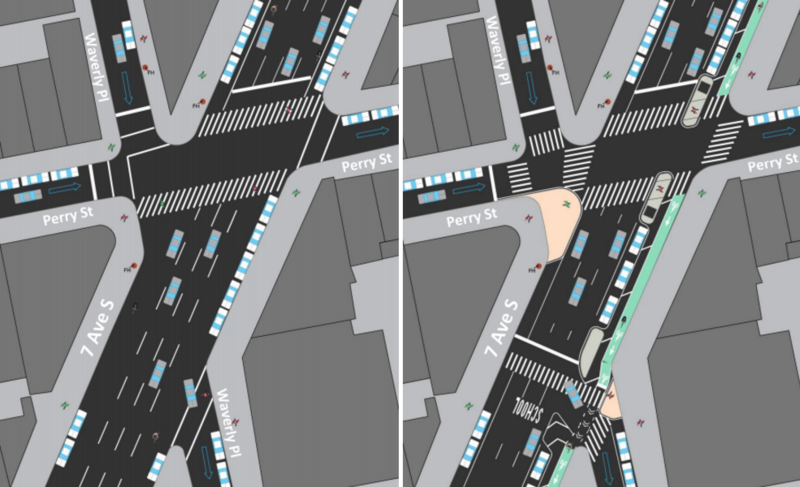 DOT installed the first leg of parking-protected bike lanes on Seventh Avenue from 30th Street to 14th Street at the end of last year. The southern segment cuts through the irregular angles of the West Village grid between 14th Street and Clarkson Street [PDF]. Thermoplastic markings are down for the new segment and drivers are parking to the right of the bike lane. Next up: green bike lane paint, concrete pedestrian islands at five intersections, and other safety improvements for walking. Parents and staff at PS 41, on Greenwich Avenue, began campaigning for safer crossings on Seventh Avenue in the Village five years ago. The new bike lane segment terminates at Clarkson Street. Presenting the project one year ago, DOT reps said they hoped to extend the bike lane further south sometime in the future. Waverly Place should be pedestrianized between Perry and 11th. Perry should be pedestrianzed between Greenwich and 7th. Greenwich should be pedestrianized between 7th Ave and 12th St, as well as Bank St between Waverly and Greenwich. These streets make no sense whatsoever. And of course there is much too much on street parking everywhere in this neighborhood. the atrocity that is Seventh below 14th should be removed and the pre-existing street grid restored. The village has been harmed ever since Seventh was blasted through the neighborhood. 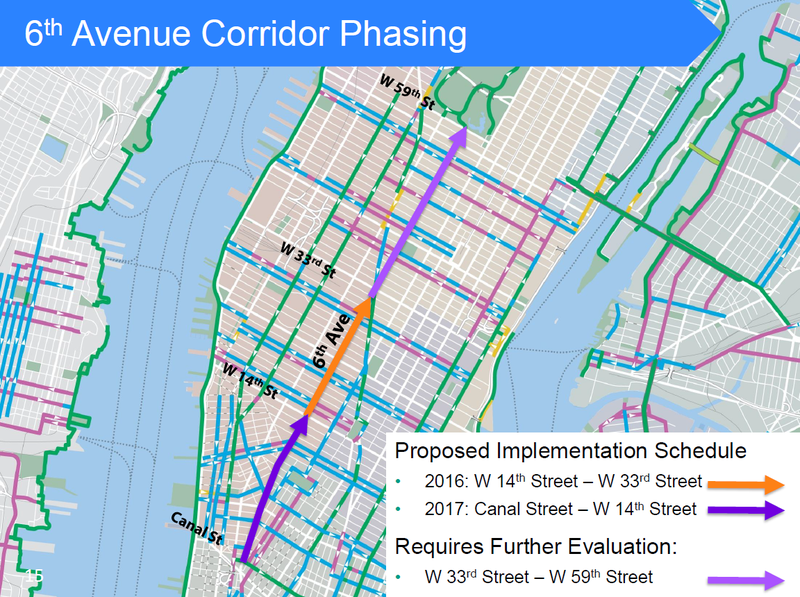 Speaking of bike lane extensions promised in CB presentations, was there ever any follow up about the extention of the Sixth Ave protected bike lane down to Canal St that–back in Nov 2015– DOT said would take place in 2017?